Cost effective transport solutions for the recycling industry throughout UK & Ireland. Walking Floor Transport We provide 20% more capacity than standard walking floor trailers providing two major benefits. Miller Transport pride themselves in the courteous and friendly service they offer, from enquiry to payment receipt we aim to be as friendly and efficient as possible. Some of the targets we have set ourselves include; responding to quotation enquires within 24 hours, invoices including waste transfer notes sent by middle of the following week and be as flexible as possible to accommodate our customers' needs. "20% extra capacity than standard walking floor trailers"
"Up to 50% more payload than bulk tippers and no tipping risk!" Miller Transport's large volume walking floor trailers provide 20% more capacity than standard walking floor trailers and up to 50% more than Bulk tipping trailers, providing two major benefits to our customers. Firstly we can be more cost effective as we are able to transport more material per load and therefore reduce the cost per tonne of transport; secondly as the material is moved with fewer loads it reduces the carbon footprint of the recycling process, making Miller Transport one of the greenest transport providers in the industry. 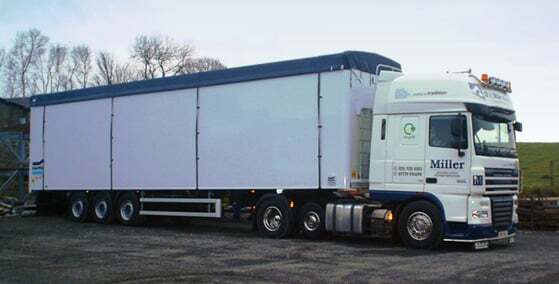 Miller Transport operates these trailers throughout the UK & Ireland with availability daily for movements both within the UK and across the Irish Sea. Miller Transport's strong and robust steel scrap trailers can handle even the most aggressive of recyclable material, from full engines to steel girders we are able to provide the transport solution you require throughout the UK & Ireland and across the Irish Sea. Miller Transport has the expertise and ability to transport a wide range of goods and material; long, flat and palletised goods and material are no problem, with availability daily throughout the UK and across the Irish Sea. 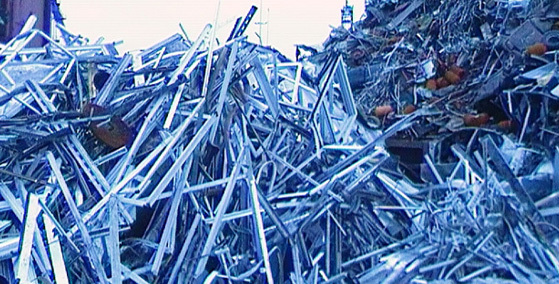 Pictures include aluminium, baled aluminium, copper and tyres. Waste Electrical and Electronic Equipment (WEEE) Dry Mixed Recyclables, Sheered aluminium, Stainless Steel, cooper, Alloy wheels, waste tyres and tyre crumb, sawdust, woodchip, waste paper, farm plastic, CRT glass, waste plasterboard, green waste and Municipal waste. Should you require a solution to your transport requirement contact us.